Our company founders were there in the spring of 1958 when the gas grill was invented and since then, we have taken an active role in the outdoor grilling industry. Over the years, we've often been told by unhappy property managers that their community grills have been left on after use. These grills then become a real safety hazard and a significant waste of precious energy. We strove to provide a remedy. The PGS FuelStop is our exclusive, built-in mechanical one-hour gas grill timer that will automatically shut off the gas supply after one hour of use. Need more time to cook? Just reset the timer. 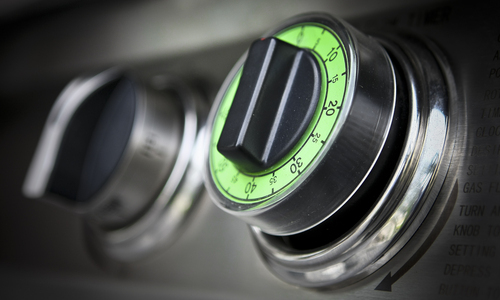 With our grill timers already installed on all PGS T-Series grills, property managers can rest easy. This energy saving feature allows for the ultimate in "green" performance grilling by automatically shutting off the gas flow after one hour. This means no wasted fuel and no risk of injury to residents. At AEI Corporation we continually build upon our previous models in order to craft the perfect outdoor grill for both residential and commercial use. Our grill timers continue that tradition. Today, we offer the finest collection of gas grills specifically designed for commercial use. Our high-quality grill timers guarantee that your grill’s gas supply automatically shuts off after one hour. This is perfect for shared and commercial grills so that owners and managers do not need to worry about a grill being left on. Not only is this safer, but it is also better for the environment and better for your grill's longevity. The gas flow timer is included with all T-Series PGS grills. When performance, safety, and long-term durability are traits you're searching for in an outdoor grill, our T Series collection comes to mind. To put it simply, our T-Series grills require significantly less maintenance to keep them looking great longer than anything else available on the market today.